The Happy Coders Team, mentored by Fortech engineers, wins the 3rd edition of the educational program “Discover Your Call in IT”, with their Volteem application, designed to ease the NGO’s efforts in recruiting volunteers. 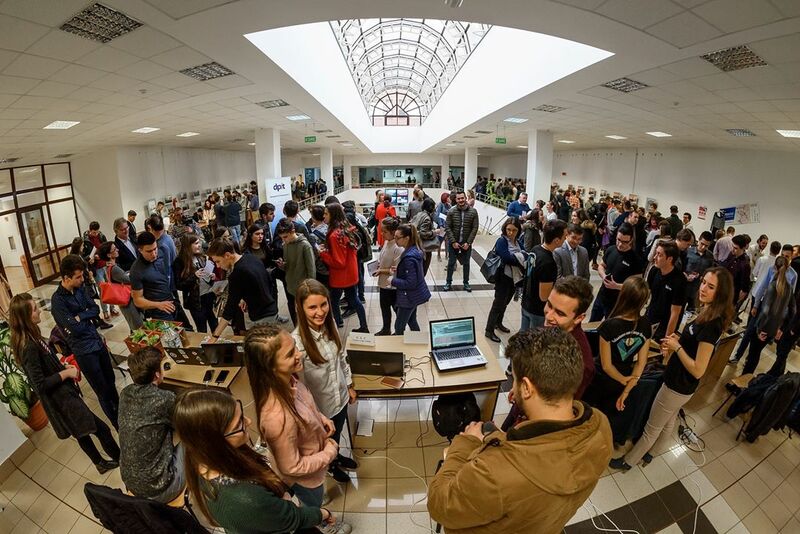 On October 26th, high school students, mentors, teachers and IT companies’ representatives gathered in the Aula Magna of Faculty of Economics and Business Administration to celebrate the closing ceremony of the 3rd edition of the “Discover Your Call in IT” program. This year, 120 high school students were enrolled in the program, under the guidance of mentors from Fortech and other nine IT companies. 24 groups of 5 youngsters were formed, generating 24 unique ideas. The applications address a diverse range of needs from event organization, educational process digitization, personal expenditures tracking, turning off the light with one touch on your mobile or irrigation systems automatization. The most promising apps were rewarded by the organizing association and its partners. The final ranking considered a mix of criteria, including application complexity, as well as teamwork and technical test results. “We believe in the education based on today’s generation needs, which nurture their potential and prepares them to react quickly to a society that is constantly changing. Above all, we are aware of the common responsibility that we share along with academic institutions, to prepare the youths for their adult life and future careers.” (Calin Vaduva, CEO Fortech). Ranked 1st in the competition, Volteem provides a new face to volunteering. It was developed by the Team Happy Coders from “Avram Iancu” Theoretical High School and mentored in Fortech by Vlad, software engineer at Fortech. Fortech committed to further support the development of the project, including it under its Seed For Tech umbrella, the Product Branch of Fortech. 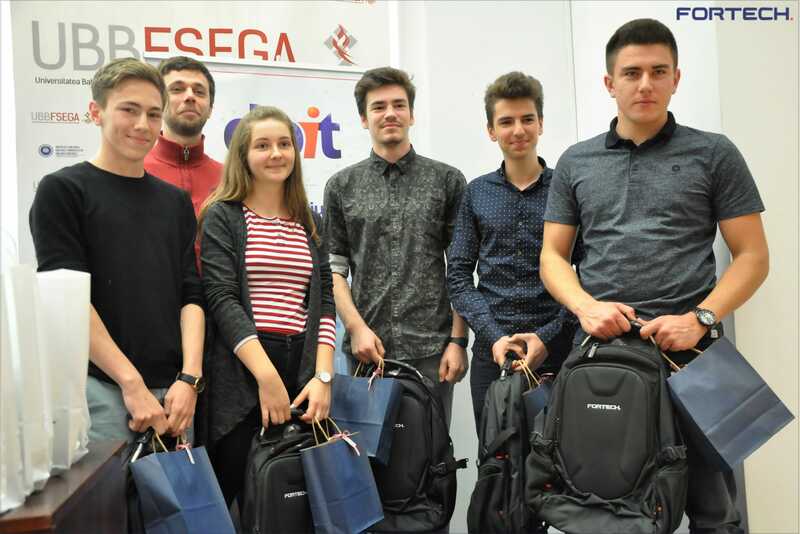 The 2nd and 3rd prizes went to the Waveline team from “Avram Iancu” Theoretical High School, for, Billit and respectively to YAPP team from George Coşbuc National College, for Presento. If Billit has the potential to change the way tax receipts are issued in Romania, Presento contributes to the effective monitoring of attendance in school, in an automatic way. Fortech offered a special prize to fSquad team, enrolled in the “Mihai Viteazul” National College in Turda. They designed Sprinkler, an app that offers solutions for automatization of irrigation systems, developing a better care program for the plants. Their mentor, Bogdan, a former software engineer at Fortech, guided the team who won last year’s competition with Lockee, an application that allows the user to unlock the door remotely. Fast Chef, an app designed to make the cooking experience easier. Just enter the ingredients you have in your fridge and Fast Chef will search for you on internet hundreds of tasty recipes. SmartPush, an app that put in practice the concept of one touch away. With only one touch on your phone screen you can, for example, switch off the light, that always is too far away from your bed, controlling the lighting system in a whole building. One second order, an app that will run on restaurants. Forget about old menus and embrace tablet menu. Once you’ve finished your order on the tablet, the app will send it directly to the restaurant’s chefs. The food will be served by a waiter and the note will be paid online with the application. In this way, you will get your order faster than you imagine. FollowFest, an app that locates two persons in areas where the GSM signal is not available. The map is working offline. By Bluetooth, you can send messages in real time and see the location of the other person. The format of the program initiated by Fortech in 2014, evolved to an independent form. Today, it is organized by the DPIT Association and implemented with the combined support of over 22 IT and academic partners which recognize that enriching and educating the next generation is neither a small task nor the sole responsibility of a single institution. The architecture of the program was designed to provide practical ways of engaging with young students to help them build a solid knowledge-base while exploring the possibilities that a career in IT could offer. The aim is to encourage them to pursue their career dreams in the field. The program was nominated in the top 3 programs in the “Academic Cooperation of the year award” category at the annual Gala organized by ANIS, right before the launch of its 3rd edition. ANIS is the most representative Romanian association for the software industry, offering recognition to the best performing national players in the IT field. DPIT is an association that promotes and supports education in IT for youths from local and regional communities. The objective of the Association is to increase the number of young people who pursue a career in IT, thus contributing to the recognition of our city as an important center for education in IT.